There’s no way to deny it: Today, it’s Monday. I’m back at work. Here I am, sitting at my desk, sipping my warm ginger tea and getting ready to write this blog post. The perk about Monday blog posts: I get to tell you all about my weekend! So, sit back and enjoy reading about what I did for the last few days. It all started Thursday evening. At 7pm, our bus departed from the Pacific Central station. The destination: Portland! We left Vancouver, crossed the border, had a 1.5 hour stop in Seattle from where another bus brought us to the desired city. I’m not much of an in-the-bus-sleeper, so that was quite a sleepless night. We arrived 30 minutes earlier than expected. At 5:30am, to be exact. We headed to the hotel straight away, where we enjoyed a good breakfast with scrambled eggs, bacon, waffles, cereal, yogurt, coffee, tea, orange juice… I could go on and on. It was soooo good! I was already looking forward to the upcoming 2 breakfasts. When we were done eating and our food coma overcame us, it was time to explore the city. First, we walked along the water at the Tom McCall Waterfront Park. Then, we headed to the Pioneer Courthouse Square. Let’s join a walking tour! It was called ‘Secrets of Portlandia’. Our tour guide Erik led us through the city for 2,5 hours. He told us about the history of Portland and how it got its name (by a coin toss, by the way). But he also showed us famous places and buildings, as well as the food truck ‘Stretch the Noodle’, which makes Chinese noodles freshly in front of you (absolutely tasty). After checking in at the hotel and refreshing ourselves, we went for dinner at an Italian restaurant. Since the day was very long already, we went back to the hotel afterwards. But not to sleep already. We spent an easy evening together with lots of different card games. 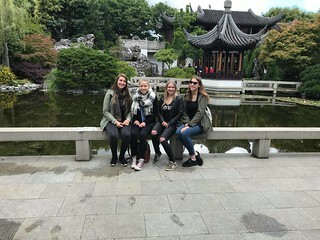 At 10am on Saturday, it was time for Miri, Elisabeth, Angy and I to go to the Lan Su Chinese Garden. The rest of the Portland gang went to have a tour on the USS Blueback submarine. It rained quite a lot in the beginning of the day, but suddenly the sun decided to show her face. The whole garden was brought into a different spotlight. The pavilions, the bridges, the water, the plants… It was just wonderful to look at. Have you ever heard of the Voodoo doughnuts? It’s what Portland is very famous for. Funny named and shaped doughnuts that are delicious and worth standing in line for 20 minutes (or more) for. It’s exactly what I did. And yes, they were so good! 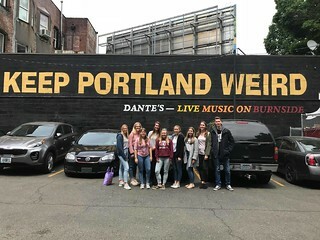 After munching doughnuts, we wanted to try the other thing Portland is famous for: Beer! A few of the 21+ aged candidates joined me to the Pints Brewhouse. We ordered the 10 beers they had on their menu. Some were awesome, but others will not make it on my ‘I want to drink that again’ list. In the evening, some of us played mini-golf. 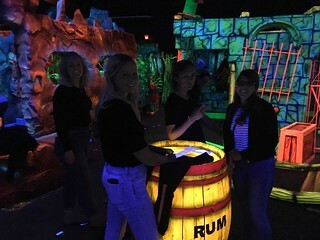 It was not just normal mini-golf, but mini-golf in blacklight with a pirate and underwater theme. Exciting! I did not win, unfortunately, but it was fun, anyway! When we got back to the hotel, we did the same as the evening before: playing card games and talking and laughing with each other. Around 3am, it was bed time. The next day was not that special. Breakfast, check-out, driving back to Vancouver by bus. And still: an entire day passed by with that. This trip was fun and great! I enjoyed having you all there! 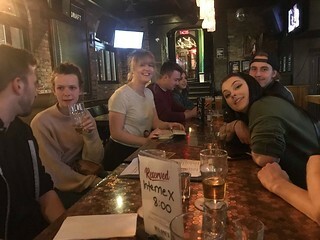 Let’s share some memories and stories this Wednesday during PuB NiGHT at Mahony & Sons! Another PuB NiGHT, in another pub, but with familiar faces. Yesterday, the INTERNeX candidates and the PR-team had a seat in the Relish Pub. For the first time since January, this pub was the place to be on a Wednesday evening. And being in this pub was not the only first-timer of the night. It was the first PuB NiGHT for our new PR-team member Elisabeth, too. As well as for several candidates, who have only been here for a few weeks or even days so far. We were sitting at 3 different tables, because we were with so many people! This is also why I decided to switch my spot every now and then. It’s nice to talk to all of you and I enjoy listening to your stories about your life here in Vancouver. 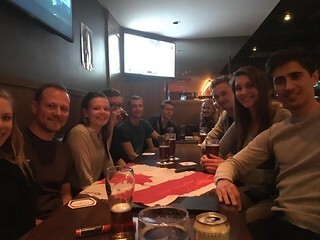 But as sad as it is, there were also people that joined our PuB NiGHT for their last time. Linus and Lore are leaving Vancouver soon. Their time here with INTERNeX has come to an end, unfortunately. So, we had one, two or three (maybe even more) last beers together. We even signed a Canada flag with our names and personal messages that serves as a memory. We’ll miss you guys! Have a safe trip, I’m sure we’ll see each other again somewhere in this world! I hope you all enjoyed the PuB NiGHT as well! It’s Thursday afternoon, I am sitting in the office, staring at my laptop and I am feeling tired. Tired on a Thursday afternoon? How is this even possible? Well, it can only be one thing: Last night was pub night. We met at Malone’s Social Lounge and Tap House this time. At 8pm, we sat down at the table in this cozy and big pub. We looked at the food and beer menu, WOW – there are 38 taps you can choose from. And so, we ordered pizzas, chicken tenders and the special beer on Wednesday nights, the P49 Craft lager for $3.90– who can say no to such an offer? Around 11:30pm, when the Malone’s was taking orders for the last round, we decided to switch locations. So, some of us went to the Bourbon. We entered the bar and… there were only 5 other people in the pub. Okay, so it was not busy at all, but this fact didn’t stop us from dancing, singing along to well known songs and playing pool. I hope you all enjoyed it too and I see many of you tomorrow at 7am for our trip to the Rocky Mountains! Are you a hungry and thirsty person? Someone who enjoys eating and having now and then a drink or two? But sometimes the prices are just too high for you and you don’t know how to save money? Well, then you are lucky! 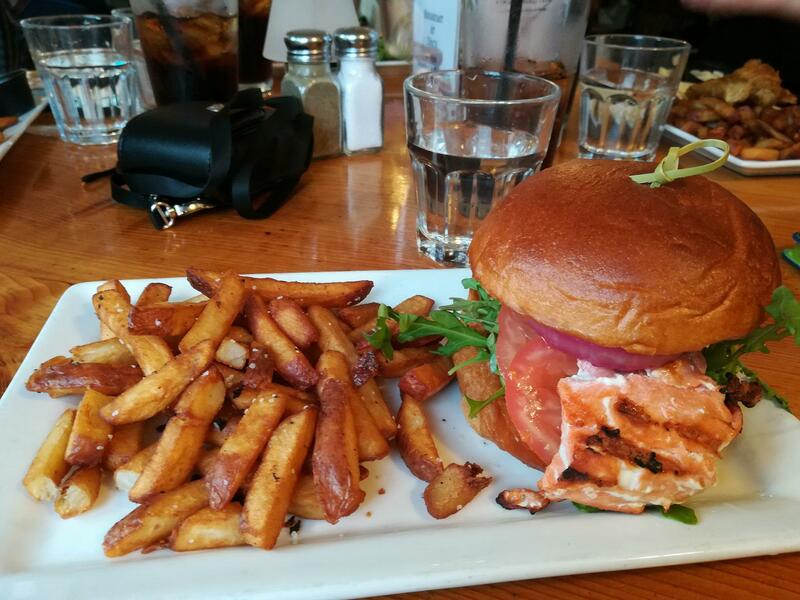 Happy Hour offerings can be found in many pubs and restaurants here in beautiful Vancouver. Some great deals are waiting for you. Here is a guide on how to get through the week with a full and happy stomach. Monday: Are you not over the fact yet that it’s Monday again? On Monday, the Gyu-Kaku Japanese BBQ restaurant has all day Happy Hour, so maybe the delicious food and drinks will brighten your mood. Or you visit the Happy Hour at the Flying Pig. Or as they call it: ‘Appy Hour’. Between 4-6pm, the house lager costs only $4.75, as well as the house red and white wines. Tuesday: Hungry for tacos? Good, because it’s Taco Tuesday! Come to Taco Time at the International Village Mall and get yourself a beef or veggie taco for $1.49 only! Or you visit Gringo in Gastown where you can get tacos for $2.75 each. But when you’re there already, why don’t you just enjoy 6 tacos for $15 only. So what are you waiting for? Oh, you’re thirsty? La Mezcaleria in Gastown has Happy Hour from 9-11pm and you get the house wines and the Juan de Fuca Lager for $6 only! Wednesday: Do you want chicken wings? Go to the Pint Public House between 3-6pm and get with any pint (20oz) a free order of their 40-ways wings. 40-ways means that you can choose from one of their 40 flavours which can come in the form of a sauce, a dry rub or a dip. The best part about this deal? It’s valid from Monday to Friday – yay! Thursday: It’s thirsty Thursday. Go and spoil yourself at Homer St. Cafe and Bar in downtown with the Wishbone lager or highballs for $5 or with the house wines for $6. This Happy Hour deal is valid from 2:30-5:30pm and then again from 9:30 until closing time. Cheers! Friday: How about starting the weekend with a burger and beer for $7 only? Sounds too good to be true? Not really, because this is exactly what you get at the Metropole on Abbott Street. And for $1 extra, you can add some delicious bacon on that burger. Also, drinks such as beers, shots and highballs are $3.50 on that day at the Met. Saturday: It’s finally weekend! So let’s go to El Caminos. Besides Latin American street food, you can get Main St. Pilsner for $4, El Tigre shot for $3 and the Paloma Cocktail for $6 during Happy Hour. This is valid from 3-6pm and from 10pm until closing time. Sunday: Please people, Sunday is rest day. It’s time to give your liver and stomach a break. So you are asking me how my weekend was? Well, I would love to tell you about my weekend, because I had a great one. I spent my time well in Seattle. What Seattle? Yes, this weekend was our trip to Seattle! It was great, so sit back and read all our adventures we did over there. It all started on Saturday early in the morning. Too early to get up. But we had to, because today was the big day. We are going to Seattle! It was 7 am and we met at Canada place. The bus was waiting to get us to the United States. There we go! We crossed the border with no problems and stopped in Bellingham to go shopping in the big outlet. Now it was even cheaper with a lot of Black Friday deals going on. When all the shoes, clothes, purses and gifts where loaded in the bus, we continued our way to Seattle. After a little sightseeing tour we arrived at our hotel, where we prepared ourselves for a diner and night out. Our tour guide recommended a nice place where we could eat. So we went there, a nice biker bar with good music and delicious food. After our meals it was time to have some beers together. There was this one place with over a hundred different beers. We tried some of them before we decided to continue our night in a club. We ended up in a small club with a DJ playing nice songs. The alarm went of at 8 am. It was time to discover Seattle a little more. Half asleep we arrived at the breakfast. After some food and a lot of coffee we sat in the bus for another sightseeing tour through Seattle. We arrived in the city center where some girls went shopping, while we went to the underground tour. A stand-up comedian guided us underneath the streets of Seattle. It was a really interesting and fun tour. The tour ended around noon, so lunch it was. The restaurant where we ate was next to the see, so we had a beautiful view while eating our great lunch. In Seattle is an alley where the walls are all covered in gum. It was close to the restaurant, so we decided to take a look. It was strange and beautiful at the same time. You could even smell the sweet scent of gum. We putted our gums at the wall and continued to the cupcake shop to make a plan for the rest of the day. We decided to take the monorail to a park next to the lake to see a good view. We drank some coffee in a café there, before we had to get back to the bus. On our way back we did some duty free shopping before crossing the border of Canada. At home it was time to have a good sleep. For everybody who joined this trip, thank you! You made this trip a lot of fun! Want to hear more stories of Seattle? Come to PuB NiGHT this Wednesday and I will tell you more while playing the Bourbon Bingo.